The class teachers should have immediate knowledge about the classes allotted to them. They should have information regarding the students attending these classes as well. They can set this information by maintaining the details in the provided roster template formats. By accessing these rosters online, the teachers would be able to monitor the progress of the students online. They could give their feedback by emailing the students as well. This is beneficial for the overall development of the student. 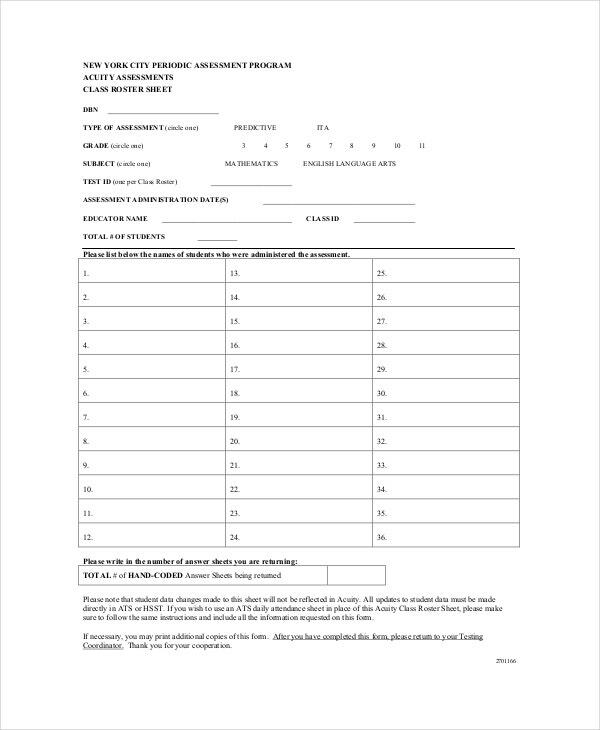 You may also see Roster Form Templates. This is the template of an elementary class roster giving details of the teachers and the allocation of the rooms for conducting the classes. It also contains the roster for selected classes. 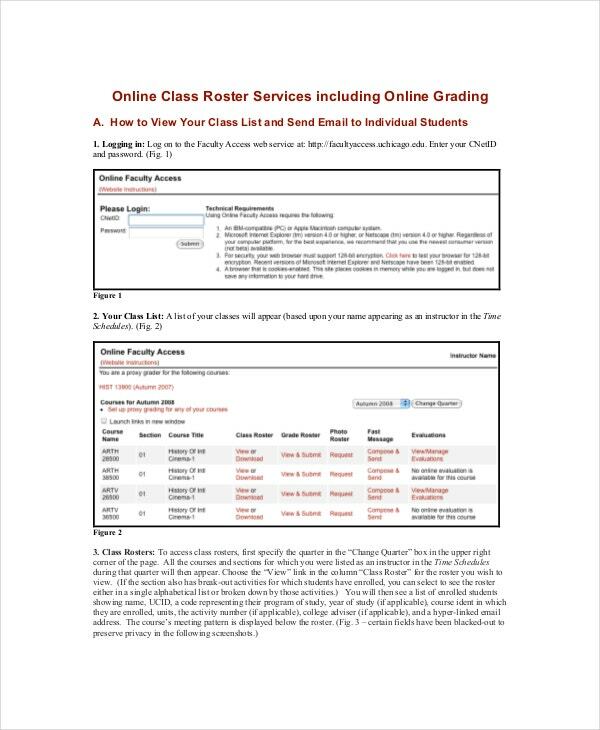 You get the desired student information by using this roster template. You can have the details of each student. 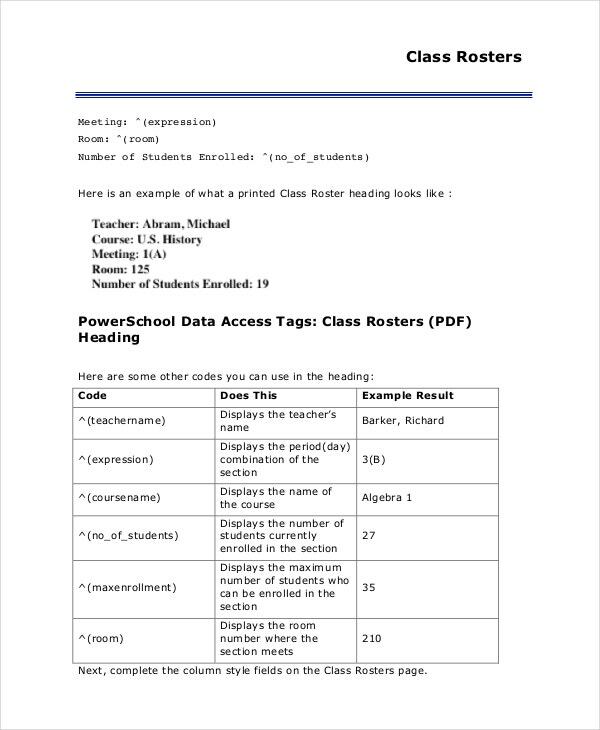 You can highlight additional student data as well. The Online Class Roster Template helps the instructor to maintain the data of his students at a single location. He can access the same at any point and send emails to students regarding their academic progress. This template also allows for online access to the instructor to call for the photographs of the student for issuing their ID cards. You can maintain data of the student grades as well. 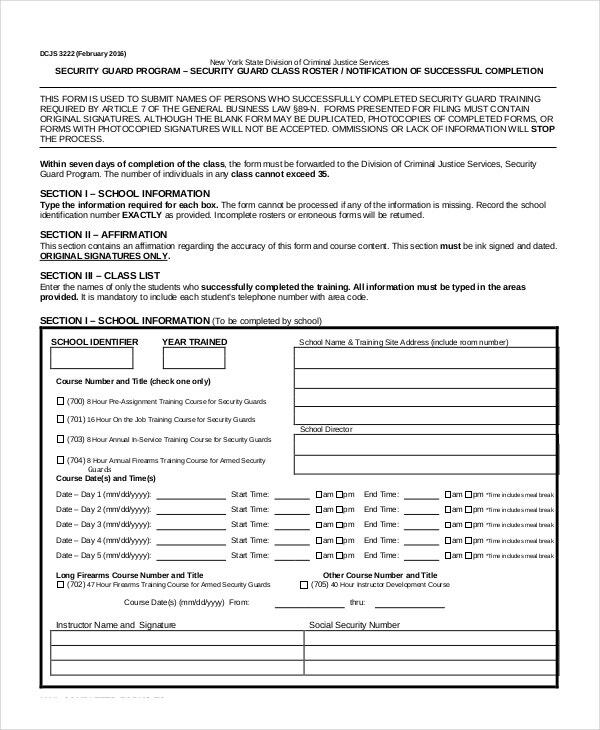 This is a Security Guards Program Class Template. The schools conducting these courses have a mandatory requirement of furnishing the names of the persons who have completed their security guards training program to the Division of Criminal Justice Services. You can submit the information of a maximum of 35 guards on a single occasion. This is a simple template of the Kindergarten Class Roster. This includes the name of the service provider along with the names and details of the children. The details include the date of birth, proof of residence, and the details about the birth registration of the student. You have to submit different forms for each class. 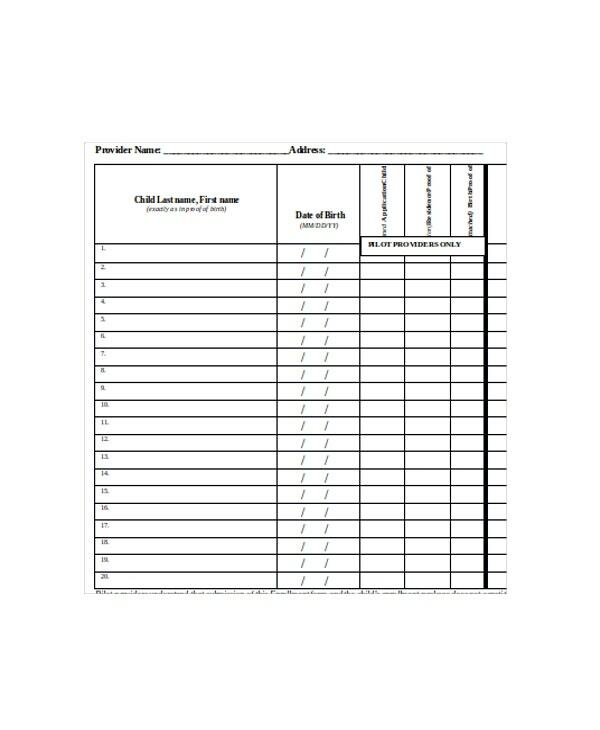 This template of the class roster is of great utility to create roll sheets for all the teachers in your school. Accessing the rosters would give you information about the names of the teachers as well as the details of the classes they take. It also gives the emergency contact number of each student. You can use the template to edit as well as add fresh information. > Who Can use the Information? Preparing the class roster is important for teachers as they get first-hand information about the students. These rosters also have the emergency contact numbers of the student. Some of the rosters detailed above give the details of the classes that the teacher has to take. It maintains a record of the classes taken by the teachers as well. 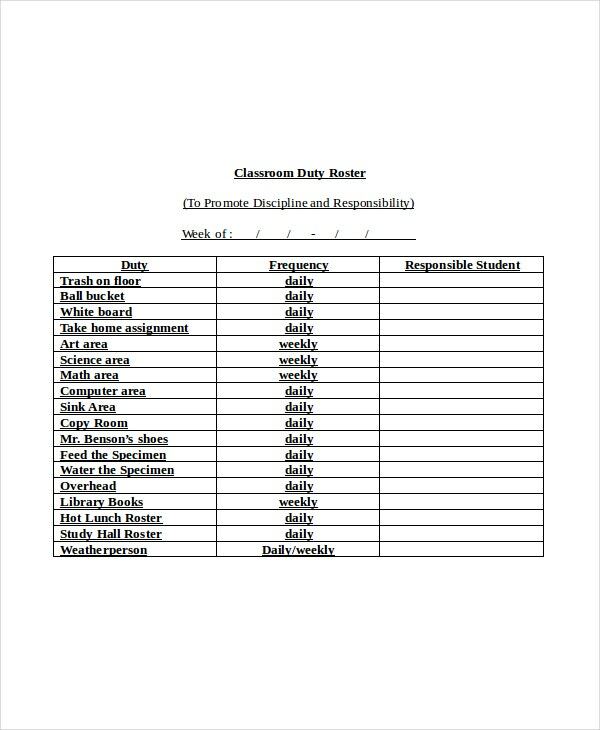 The teachers can use these templates to register the progress of each student and use the same to monitor the student. The templates enable the teacher to access this information online as well. 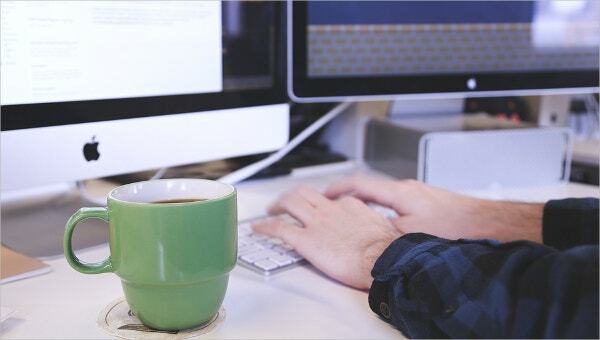 The teacher can send emails to the student notifying his progress. This could help the student to improve. You may also see Shift Schedule Template. The target audiences in these templates are the teachers as well as the students. The teachers would have a perfect schedule of the classes they have to take. These rosters can also give the details of the students in their classes. The roster contains the emergency contact numbers of the students as well. You may be able to contact them in the case of emergency. The maintenance of these rosters is mandatory in certain cases like that of the training imparted to the security guards. The schools conducting such training courses should inform the names if the security guards completing this training to the Division of Criminal Justice. You may also see Monthly Work Schedule Template. The major benefit of using the templates is that they enable the teachers to have an idea about the classes allotted to them. They also get the details of the students in their classes. They are able to maintain the present status of the performance of the students and monitor the same online for their benefit as well. 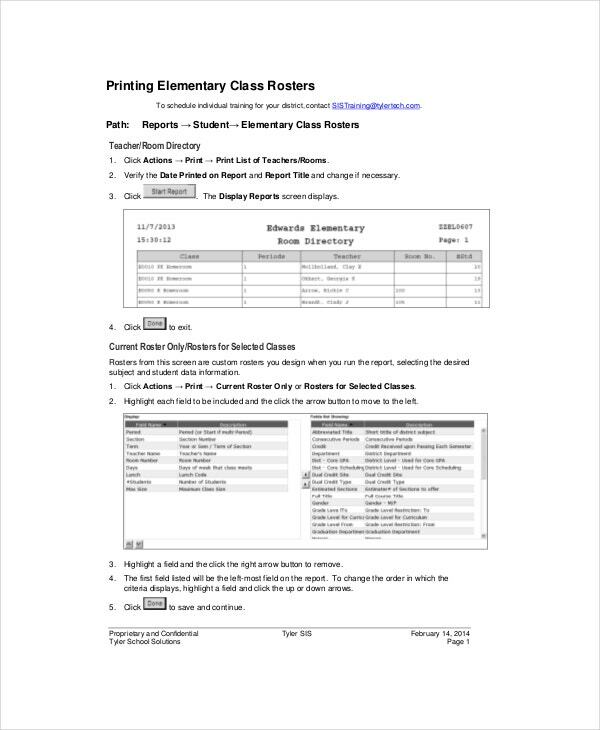 The kindergarten roster template have details of the students enrolled school class wise. The Special Guards Program class roster is a mandatory requirement. The schools have to submit the details of the students completing the course to the security authorities. The maintenance of these class rosters is of great benefit to teachers and students. The teachers would have information about the classes allotted to them. Having the details of the students enrolled in such classes is also beneficial to the teachers in many ways. The training roster not only helps in maintaining the training schedules but also in monitoring the progress of each student.